This event "La Bomba Cumbia Party mit La Mula Santa, Messtizaje, Dj Yanakuna, Dagvii" @ Hangar49 has already ended on 04/18/2019. Here you can find upcoming events for this location! 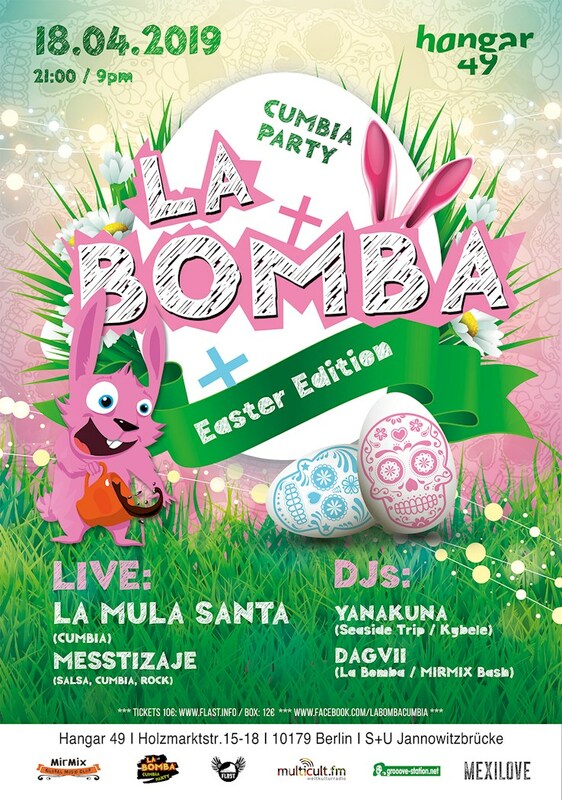 EASTER time is CUMBIA time! La Bomba Cumbia Party Berlin presents the oldest Berlin based cumbia band La Mula Santa and the (maybe) youngest one with the record release this evening Messtizaje Band. For the long night will be responsible 2 DJs: Yanakuna from Kybele & Seaside Trip and our resident DAGVII. Don't worry it's Thursday - next day you have free! The Chilean band La Mula Santa mix cumbia, rock, and different Latin-American rhythms in a spicy trunk. The Band lead Mauro Valenzuela, born in Chile and based in Berlin since many years meet the other musicians in a Chilean Bar in a colorful mixture of nationalities i.e. Chile, Armenia, Germany, Malta, Australia, Peru, Mexico. The Bar in F´hain district in Berlin called "El Caiman" was the place where they meed each other and since many years they are together doing concerts in Germany and Europe. Freedom in all aspects and for sure in the music is the registered character of La Mula Santa the sound and the rhythm and the incredible power to the stage, let no man without dancing. If you like passionate and Latin American music, you will love La Mula Santa. From Tierra del Fuego at the extreme southern of South America until the United States, from the Andes to the Atlantic coast, the Colombian Cumbia is popular, while in Europe it is still an amazingly well kept secret. Located on the Caribbean coast of Colombia, this music has been not only in Latin America but also international success. The Band identity comes not only from the infectious beat of the Cumbia, but also of different Latin-American rhythms like Merengue, Salsa, Bomba, Guajira, Reggaeton and Latin Rock. The band was founded in Berlin in November 2013 by brothers Cesar and Matias Cuculic with the purpose of making a project where they could experiment with all of their musical influences mixed together. They started writing and pre- producing songs that same month the group was formed. By May of 2014 all songs where finished and started recording a promo EP titled "Freak Your Mind" where Matias Cuculic was in charge of the production and Cesar Cuculic of the co-production and arrangements. All instruments were played and programmed by the duo themselves. The record presented a wide number of genres such as metal, reggae, trap-hop, hip-hop, bossa, latin among others, featuring as well, lyrics in different languages. The promo EP was received with good reviews and promoted through a music video of the song "Freak Your Mind", receiving 10000 plays on its first week. The duo presented the songs in an acoustic format in a leg of shows in south of Spain and Berlin. Right now, the band is finishing recording their first official EP. In August 25th 2017, the band organized their own alternative festival, debuting as a full band and bringing 100 people to their show. The band is getting ready for their 2018 summer tour to present their first official EP, as a band, called “Cumbias Ilegales” to be out on June 2018. Dates in Germany, Poland and Czech Republic confirmed. Half Russian and half German and as boundless as his music, he has traversed the musical landscape since he was a child. His crossover of traditional sounds and modern beats tears down any cultural walls. It is accompaniment, atmosphere, inspiration and comfort all in one – energetic and uplifting to the last drop. At La Bomba he plays digital cumbia mixed with global bass and surprised latin music.